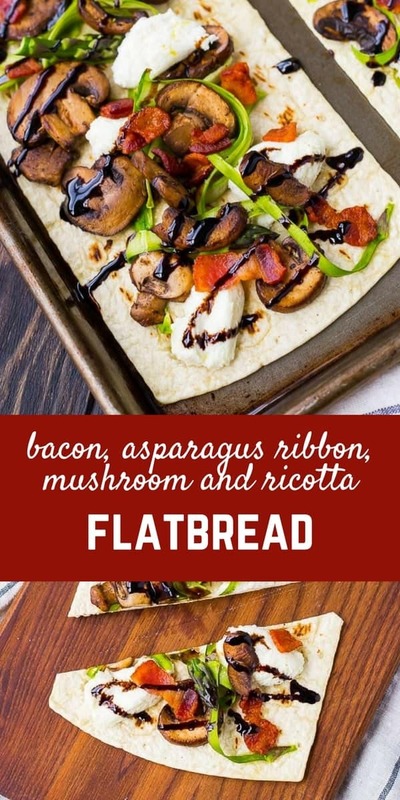 Coming together in less than 20 minutes, this mushroom flatbread with bacon, ricotta, and shaved asparagus is the perfect quick and easy summer lunch or dinner. You’ll love the contrast of fresh and rich flavors! This post is in partnership with Flatout. Thanks for supporting Rachel Cooks by reading about brands I love and use in my home! 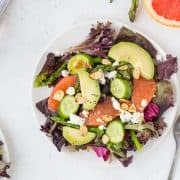 I have a daily struggle between wanting to eat really good, restaurant-quality food every single day (every single meal!) and also wanting to do the bare minimum amount of work. It’s true. I really do love to cook (given the fact that I have a business based on just that), but dang it’s hard with a 6-year-old and a 4-year-old. And I’m not even going to pretend it’s not hard for those of you that don’t have kids at home with you. Some days I’d really just rather be hanging out with my family rather than cooking for hours. Or just sitting down. 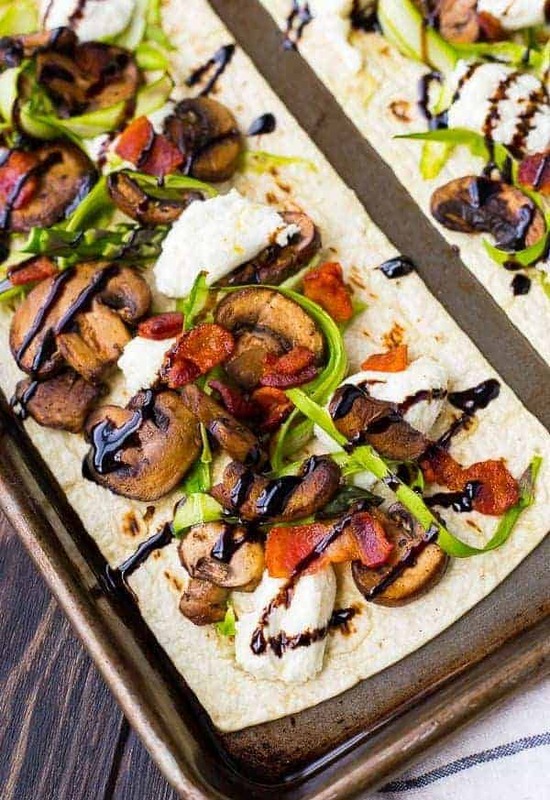 This bacon and mushroom flatbread is the perfect solution. It comes together in minutes, especially if you have that bacon cooked in advance. One of the things I love about Flatout’s Artisan Thin Pizza crust is that it cooks in 10 minutes, or even less, depending on what you top it with. It gets ultra crispy and can hold up really well to substantial amounts of toppings. I wanted to keep this mushroom flatbread pretty simple and clean — the way I typically love my food. I spritzed the crust with olive oil to help it get extra crisp and golden brown, and then gave it a quick pre-bake (only 2 minutes!). After that, I added sauteed mushrooms (you’ll want to saute them first so they don’t release all their moisture onto your pizza crust), dollops of ricotta cheese, crispy bacon, and beautiful ribbons of asparagus. Those ribbons are super easy to make. You snip the tough end off the asparagus as you normally would and then you lay the asparagus flat on a cutting board. Using a vegetable peeler, you peel off ribbons. I kept the tops and also put those on the mushroom flatbread so that they wouldn’t go to waste. When it came out of the oven, I drizzled with balsamic reduction and a little bit of really good extra virgin olive oil. It was the perfect lunch! 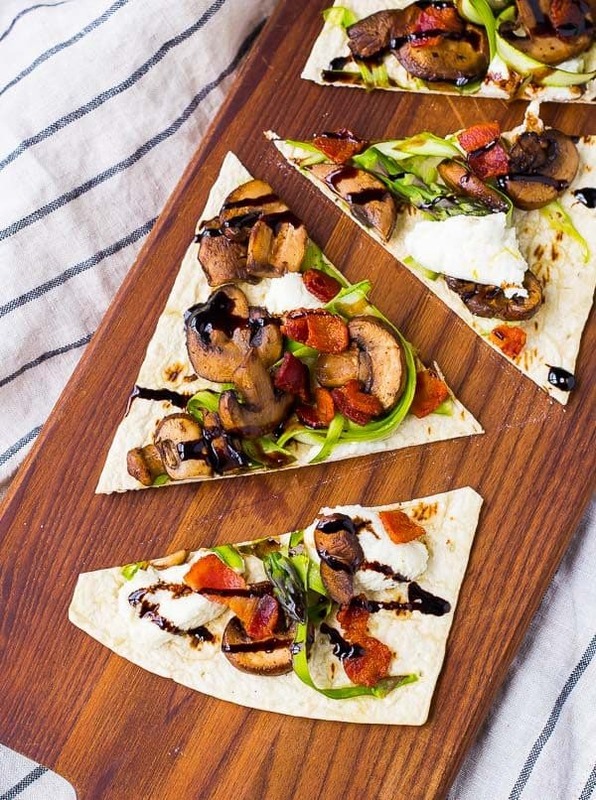 Coming together in less than 10 minutes, this mushroom flatbread with bacon, ricotta, and shaved asparagus is the perfect quick and easy summer lunch or dinner. You’ll love the contrast of fresh and rich flavors! Preheat oven to 375°F. Lay out three Flatout Artisan Thin Pizza Crusts on a baking sheet and spray or brush with a bit of olive oil (it’s optional but makes them a pretty golden brown). In a frying pan, heat olive oil or bacon grease over medium-high heat and add sliced mushrooms. Cook, stirring occasionally, until golden brown. Place crusts in preheated oven and prebake for 2 minutes. 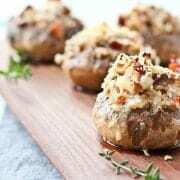 Remove from oven and carefully add mushrooms, asparagus ribbons and tops, ricotta (in dollops), and bacon. Bake again for 4-6 minutes or until everything is heated through and crust is crispy. 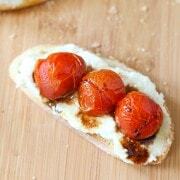 Drizzle with balsamic glaze and serve immediately. Note: Thick asparagus works best for making ribbons. 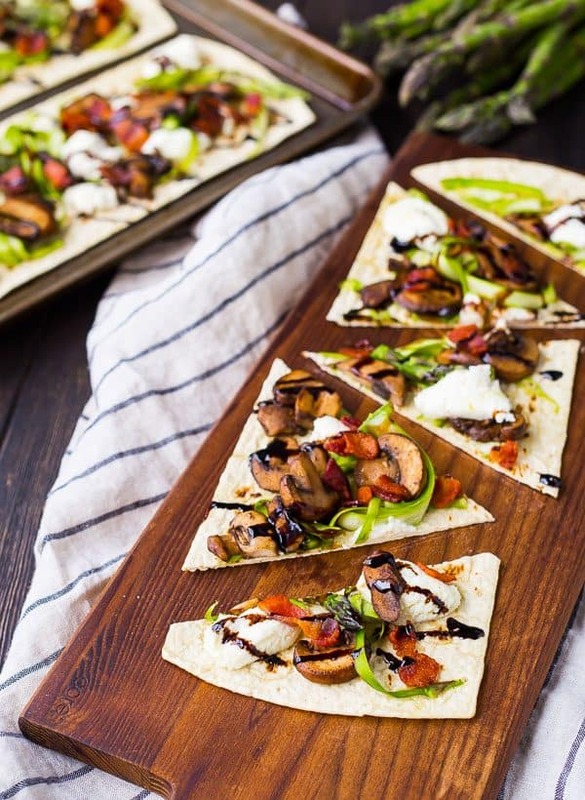 Verdict: I love this mushroom flatbread – it has some of my favorite things on it and it screams summer thanks to those pretty asparagus ribbons. You guys are going to love this one! Husband’s take: No complaints from the peanut gallery on this one. Changes I would make: None are necessary! 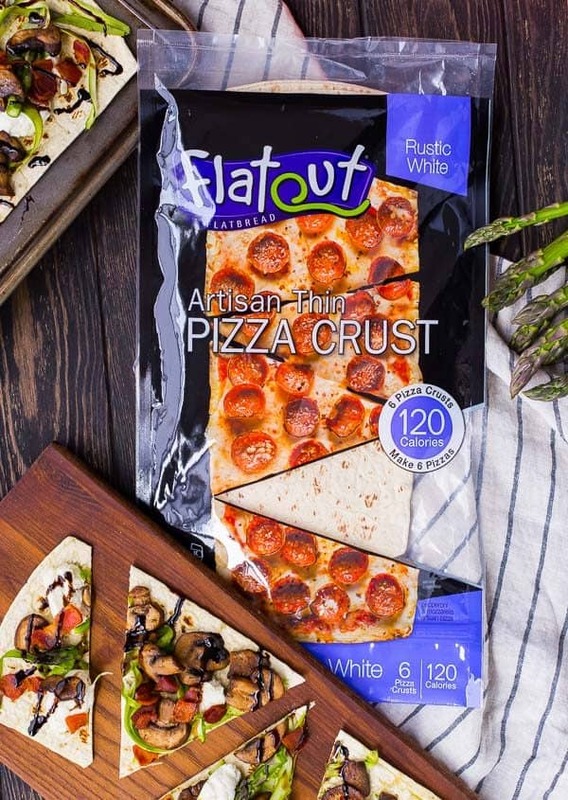 You can easily find Flatout Flatbread near you using FlatoutFinder.com. You can also follow along for recipe ideas on Facebook, Twitter, or their blog. 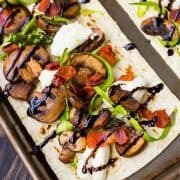 Disclosure: I’m excited to partner with Flatout Flatbread to bring you quick and delicious recipes like this mushroom flatbread. I have been compensated for my time but all opinions are always my own. Thank you for supporting Rachel Cooks by reading about brands we love and use in our own home.